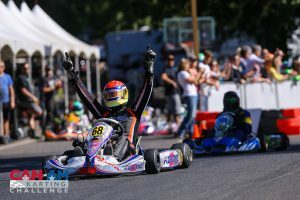 For the second year in a row the CAN-AM Karting Challenge took to the tight confines of the Pat’s Acres Racing Complex in Canby, Oregon to close out their championship season. The tricky track configuration is among the favorite for many drivers competing in the Pacific Northwest, as drivers tackle a roller coaster of a lap around trees, hills and even a river. Utilizing the championship format, all of the focus came down to Sunday’s final races to determine the 2016 CAN-AM Karting Challenge class champions. When the races were complete, the dust settled and the points were tallied, it was two Canadian drivers who earned the biggest prizes up for grabs as Coltin McCaughan scored the championship in Rotax Senior and will represent the series at the Rotax Max Challenge Grand Finals in Italy while Matthew Taskinen took home the top honors in Rotax Junior and he too will compete in Italy. While McCaughan took home the title in Can-Am Rotax Senior, it was Kyle Dupell who excelled throughout the weekend, driving a near perfect event, topping Qualifying, all three heat races, the PreFinal and Final, doing everything he could to muscle into McCaughan’s championship lead. However entering the weekend with a large margin courtesy of four race victories, McCaughan played it smart and maintained his position inside the top-three all weekend to erupt as champion. Making his return to the sport after a hiatus, Parker McKean delivered a second place performance behind Dupell. It was a similar story in Can-Am Rotax Junior as championship hopeful Mason Buck did nearly everything he could to cut into the lead that Matthew Taskinen had built throughout the first two rounds. After qualifying it was a pair of ladies on the front row for the heats as Hannah Greenemeier and Ellie Musgrave led the way early in the weekend. However after the heats, Taskinen was in control while Buck was further down the order after finding trouble in heat two. On Sunday it was a different story altogether as Buck drove through the crowd to win the Prefinal and then left his mark on the category in the Final, delivering a large victory ahead of Edward Portz with Taskinen third. But it wasn’t enough to overtake Taskinen for the championship, who entered the weekend with three victories to his credit and left with his first ticket to the Rotax Grand Finals. For their efforts as vice-champion in their categories, both Dupell and Buck earned free entry to the US Open of Las Vegas. It was another strong showing in Briggs & Stratton LO206 Senior as drivers from up and down the west coast entered the event. Local hero Joey Wimsett led the way throughout Saturday, taking the pole-position and cruising to three easy victories in the heat races. But that all changed on Sunday when he was shuffled out in the PreFinal and had to start the final from fifth on the grid as Cameron Egger took the reigns. In a final that drew everyone in attendance to the fences, Austin Elliot took home the victory followed by Harrison Mills and Kyle Wick while Wimsett crossed the line in fifth after contact on the final lap saw him create a dust storm on his exit of corner two. Brady Egger finished the race in sixth and took home the championship honors. Running as separate class for the weekend, Briggs & Stratton LO206 Junior saw Austin Torgerson hold off Josh Pierson for the win as the elder Torgerson opted to only race the Briggs and rest his ailing ribs. Making her first start in the category, Hannah Greenemeier finished third. With four of a possible five wins, Torgerson was crowned the champion. Bryan Green led the way in Briggs & Stratton LO206 Masters to defend his crown as class champion. 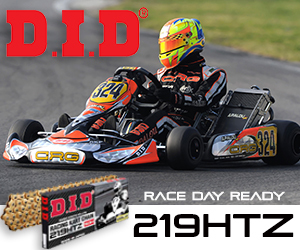 In Go Kart Hero Rotax Micro-Max it was all Ashton Torgerson all weekend long. The Oregon native dominated the category and came home with the victory and the championship over Shawn Kozma and Graham Trammell. The three would finish in the same order for the championship. The competition in MonsterX Rotax Mini-Max was tight all weekend long, but each time the checkered flag flew it was a familiar face getting to it first. Canadian Ryan Dezall topped every session except the third heat race to take home his first CAN-AM victory of the season in fine fashion. Ashton Torgerson gave him a good run for his money, but came up short at the finish to take second with Josh Pierson making a late race run to take third away from Jason Leung, who was fresh off his crowning as Canadian Mini-Max champion. Even with the dominating weekend for Dezall, Torgerson was able to barely hang on for the title, winning by only 13 points with Leung completing the championship podium. Billy Cleavelin started only three of the five Rolison Performance Group Rotax Masters Max races at the CAN-AM Karting Challenge in 2016 and he took home the victory in all three. However it wasn’t quite enough to overtake Michael Groff for the overall championship as Groff followed Cleavelin across the finish line all weekend to secure his title and earn an invitation to compete at the US Open of Las Vegas. In the Wocked Fabrication shifter category, Kyle Wick took home the race honors and the championship in S2 Semi-Pro over Cole Franchini. Andrew Wilson did the same in the 125cc Open and SMAK Plastics TaG Senior classes and while Amanda Smalley was on top in the SMAK Plastics TaG Junior class. In addition to the race awards, the CAN-AM Karting Challenge awarded the second annual Sam Fries Spirit Award to the Kozma Family. Sam was a beloved member of the CAN-AM Karting community, showing dedication, determination, fair spirit and a positive attitude every race he attended. 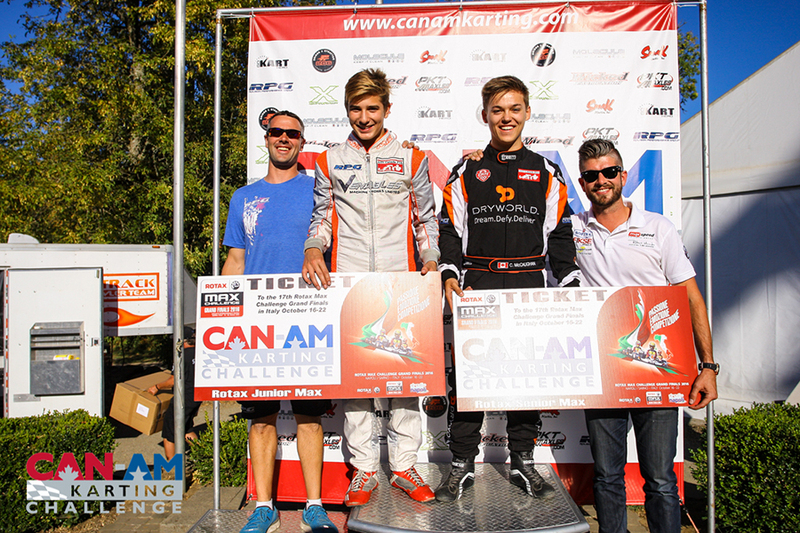 For more information about the CAN-AM Karting Challenge and to see the full championship standings for each category, visit http://canamkartingchallenge.com.